It’s officially March - and in New York City that means it’s the last mass flu / cold / sickness - we’re all feeling a bit crappy. The weather goes up into the 60’s and plummets into a sub zero freeze, then snows and it starts all over. This type of scenario calls for a vitamin rich adaptogenic + hydrating tea, and for me, it has to be something tart that I’ll actually drink throughout the day. I love this blend because it’s hydrating, full of vitamin C and it boosts the immune system while chillin you out. Big Jar of Filtered Water - I recommend the Berkey Filter if you’re struggling to find a filter! Ball Jar with Cap (if using a muslin bag - it helps keep it in place! 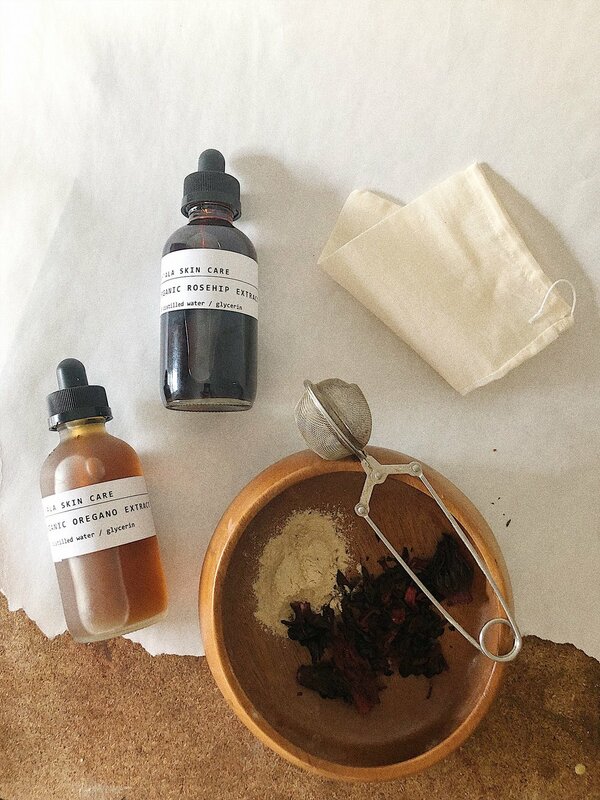 Organic Rosehips, whole, powdered or tincture! 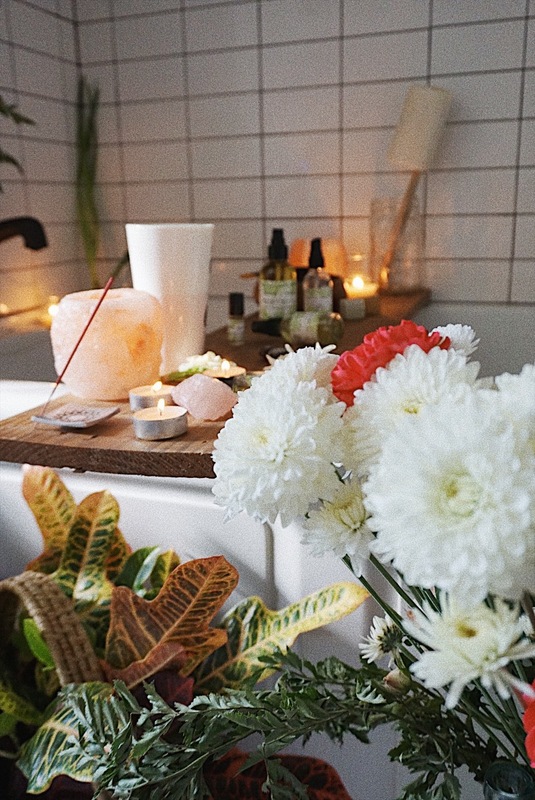 Valentine’s Day has always been one of my favorite “holidays” - the energy of this day makes me want to treat myself to a beautiful bath, candles and self-care. 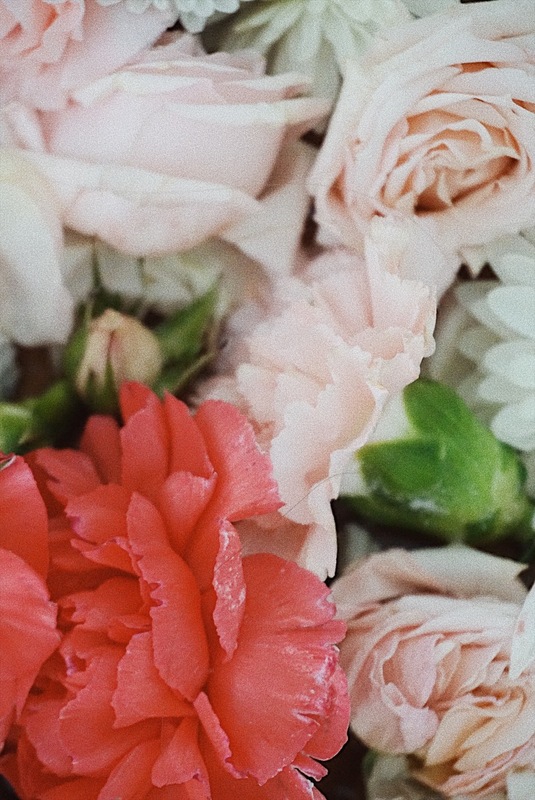 Some of my favorite bath ingredients for this time are: coconut milk, rosewater, roses, carnations, hibiscus, pink or red sea salt, rose glycerite and blood orange juice. Once in a while, your soul needs you to do something really beautiful for yourself - whether that’s a soaking bath, a fresh meal, anything you feel really good about. 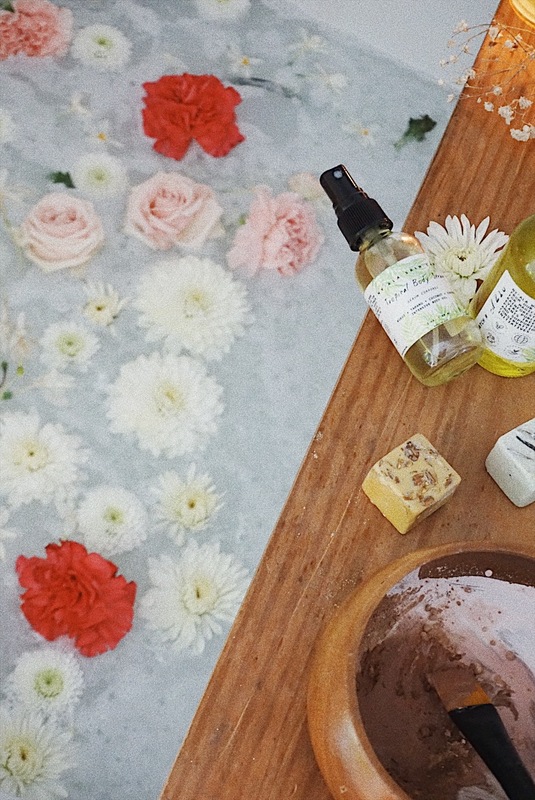 Here’s my Valentine’s Day Bath :) Make sure to check out some of the Valentine’s packages I put together. Every gift will be packaged in these reusable cotton bags that I dyed this week using Moroccan Madder Root - my best friend sent me the best dying powders on her travels - check out her travel blog on Morocco - it’s gorgeous! Blood Oranges – their beautiful deep red color makes it one of my favorite citrus fruits. The blood orange Pelligrino was my favorite drink (that can has 32 g of sugar, damn!). My stepfather Dominic grew up growing and eating blood oranges in the hills of his hometown in Sicily, so he buys them every year. Food is funny in the way that it connects history, health, emotion and visual beauty together. - Anthocyanins – Blood oranges have that deep red bloody color because of their highe concentration of this flavonoid, higher than all other orange types (kinda sounds like something Trump would say). This anti-oxidant helps inhibit cancer cell growth, induces programmed cell death (our bodies way of removing precancerous cells rather than supporting them), and helps protect cells from mutating. - Vitamin a – Blood oranges of course have a provitamin a, beta carotene that supports the reproductive and immune systems, cell function, and vision. - Vitamin c - which stimulates the production of collagen, supports the immune system, increases iron absorption, and it’s necessary for cartilage and muscles. One blood orange has 66 mg, almost 100% daily value of Vitamin C.
Clearly, these fruits are amazing. You can eat them straight, add to a salad, or smoothie, blend with coconut milk and make popsicles.. or juice them. One of my favorite ways to consume blood orange is squeezing it into sparkling water, the better version of San Pellegrino arancia rossa 😊. Diversity of color in your diet is so important, not only for the body, but the mind too. Don’t we all feel better when we consume something thoughtful and beautiful? You deserve pretty food! The day after Christmas always felt very relaxing, we’re all winding down from the holiday buzz, most of us have the day off and it’s chilly out- so it’s a restorative day. Since the summer I’ve been dealing with a pretty painful neck injury - so a pine soak for muscle recovery. Pine is also used for stress relief, skin irritation and as a boost of Vitamin A. For this soaking bath I aimed to soothe my muscles, stress relief, to clear sinuses and celebrating winter. I gathered pine and rinsed them in the sink, drew a bath. I added Epsom Salt, colloidal oats and the Pine bundles in... while diffusing eucalyptus oil. Hurricane Lane is close to hitting - so we all have a couple days off at home. It's a bit stressful when everyone is freaking out, buying an entire Costco worth of water and bread... We just bunkered down at home with candles, movies and tons of snacks. To calm myself I decided to get creative and make some rose petal and rosemary smudge sticks. I love getting flowers, but I really love reusing flowers and making them into pretty bundles, bath salts or tinctures. A "smudge" is typically a tied bundle of plant material that you would hang to dry and then burn for ceremonial or sacred purposes. There are a ton of different blends for smudges, but I'm a fan of using what you have on hand - for smudges, pick any herb that’s safe to burn or smoke. What does a smudge do? Like other ceremonial practices, this isn't a hard fact based cure or fix - this is a physical and visually beautiful way to draw attention to something you are trying to accomplish. As with anything in life, what you put attention on is what you will receive - that is nearly a fact, because it's your perception. Physically working with plants brings energy, and if you can plan what your intention is - you can help redirect energy to that place. I chose Rose + Rosemary to open myself up for healing, strength, energy and to start a new path. After struggling a couple of weeks with a bit of depression, leading to lack of exercise and a bad diet - I'm ready to revitalize my self-love and respect. It's something I used to put myself down for - having an unhealthy couple of weeks, instead understand that you needed that time, and now my intention is to focus on self-love more. Mugwort: this plant used to grow invasively everywhere around where I grew up in Staten Island New York (I know, it's a strange association, Staten island and wild growing medicinal plants). It brings on lucid dreams that can be used as a way to direct thoughts or meditations, or to bring an intention to fruition - it also helps to push you to listen to your intuition - a great smudge or smoke blend for full moon ceremony or intention setting. Mint: smells soooooo good and it's energizing. Lavender: for calming, setting a calm mood, reducing anxiety. Sage: for clearly the energy in a space and more. Rosemary: smoothes the mind and prepares a space for creativity by helping to remove bad energy. Lemongrass: purifying and cleansing - also helps to keep mosquitos and flies out of a space for a little while. Rose: healing, grief, acceptance, for heart strength. I love infusions, tinctures and decoctions - essentially concentrating the medicinal benefits of a plant. Tinctures are a great way to preserve a plant for medicinal use, or for skin care, food and flavoring. The glycerin tincture is a great alternative to the grain alcohol based solutions - especially for skin care since alcohol is irritating. You can make this recipe two ways, cold and hot. Cold Infusion - Soaking herbs in solution for 1-2 weeks. Hot Infusion - In heat safe jar place in double boiler slowcooker for 4 hours (or on a stovetop, on medium heat). All of the ingredients should be super easy to find from your local grocery store, I got everything at Down to Earth in Honolulu. Lots of hand towels + sink access! 3. Mix the glycerin + distilled water in a 3:1 ratio (3 glycerin : 1 distilled water) + add to jar, make sure to fully submerge the herbs. 4. 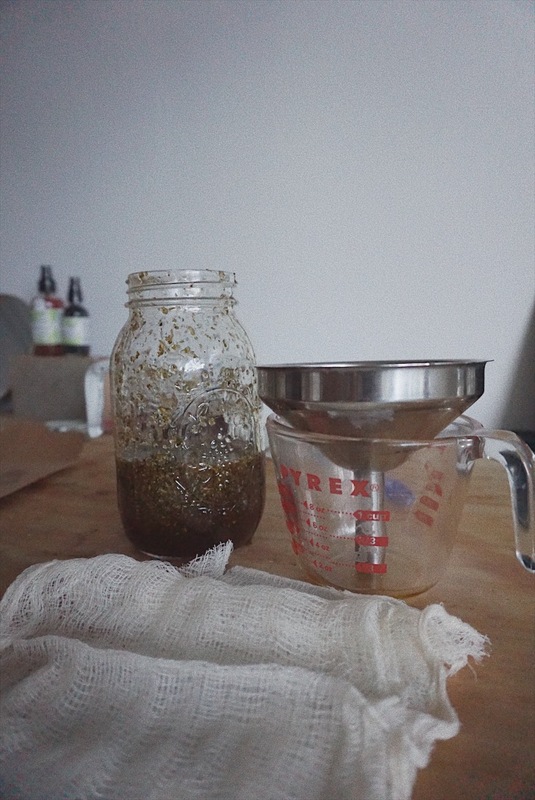 Cap + Shake the herbs - make sure to agitate and shake them up daily if you choose to do the cold infusion method. 5. Label it! Write down the name of the herb, date, ratio of ingredients (3:1 glycerin to water with herb name). 1. 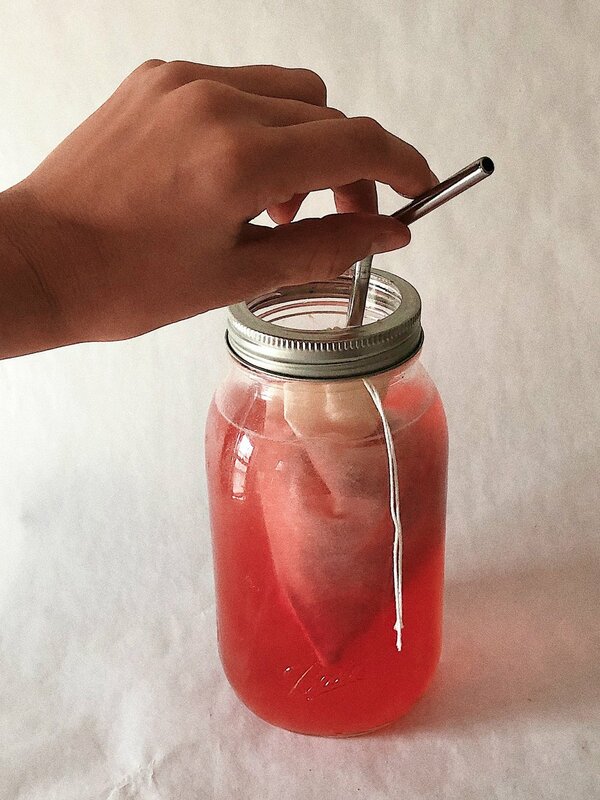 Use a clean ball jar, a funnel and cheesecloth! 2. Place the cheesecloth in the funnel for straining - pour the infusion (depending on the herb it may be thicker after infusion) onto the cheesecloth - it will now slowly strain through to the jar. 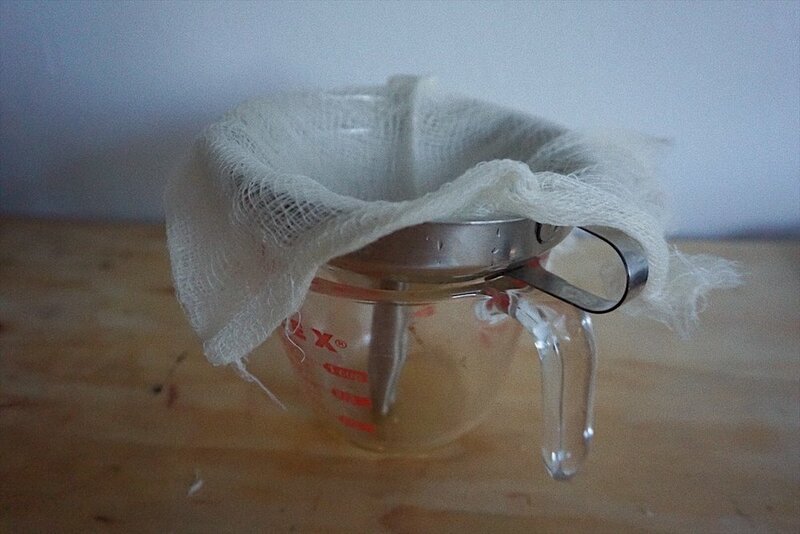 3. if it gets stuck or wont drain, fold the sides and lift the saturated cheesecloth just a bit to work the infusion through. 4. The herbs are now ready to be composted or thrown away - or you can turn them into a body scrub if they are granular! 5. Pour the herbal glycerite into a dry glass container or dropper bottle and use this internally in food / drink recipes or as a face mask / cleanser booster! I love pairing these glycerites with my cleansers or to add to a clay or botanical mask (a couple of drops!). Generally glycerin is a mild ingredient, it's a cleansing + toning emollient, so it draws moisture to the skin and helps remove excess dirt + oil - essentially it's gently cleansing without being a detergent. Due to its cleansing properties, it could be drying when it's overused - so if you are cleansing with glycerin make sure to tone and moisturize. Bath Tea is one of my absolute favorite way to use herbs. 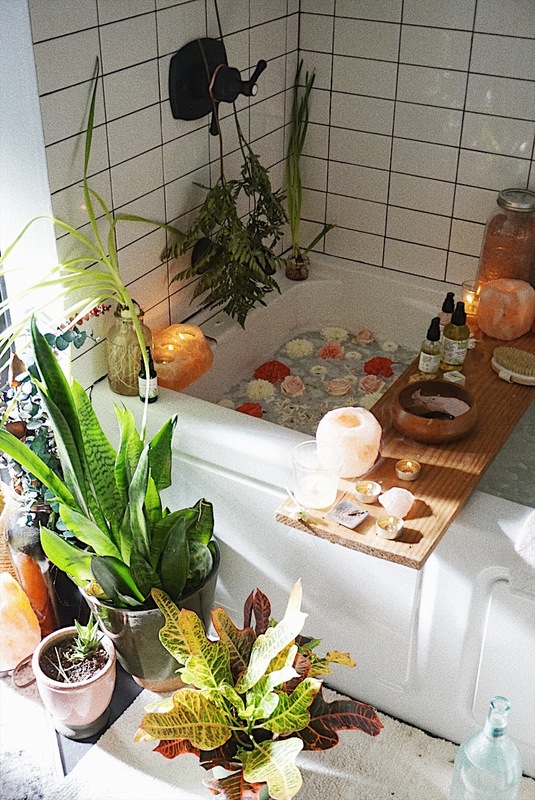 I do like a messy beautiful pinterest style bath - but if you dont want the heavy cleanup of flowers and herbs in your bath, then just simple wrap your herbs in cotton, or get a small muslin bag (if you get a Ny'Ala product, I mostly package with muslin, or you can leave me a little note!). Poultices are great to use directly on affected skin, or to toss in the bath or even as aromatherapy. I currently have a Lavender Poultice up in the store - I use this as aromatherapy, also I run under lukewarm water and apply to a burn, or cold water and to my face to close my pores - and as a quick relaxing bath tea (just toss one in!). Use code "NaturalBeauty" for 10% off of the poultice! Here are some of my favorite bath tea recipes - for each of these you can use tea bags, bulk herbs from the spice section of your healthfood or wholefoods store, or buy them on amazon "frontier" brand is great! Diffuse Lemon Grass or Eucalyptus during your bath! *Great for an exam, or if you come home from work and need to start on a project or refocus - you can use these scents in a shower too by hanging rosemary or diffusing essential oils, or by putting a couple drops on a dry sponge in the shower! Water - necessary for life and healing in so many ways. Coming from Hawai'i to New York I didn't expect to be this shocked by how dry the air is. I started to think about how important heat and humidity is for overall health.. our sinuses are moisturized, blood and lymph flows better so we are less prone to sickness, no static or that dry taute feeling on your skin. While living in New York I heavily relied on baths, tea, humidifiers and herbs that promote blood flow and warmth. This is my absolute favorite recipe for days when you feel worn down, exhausted, unhealthy or if you have a cold, flu or chest congestion. This recipe uses a combination of heat, salt, ginger and lavender to induce sweating and detoxifying. I usually leave this in a giant ball jar next to my bath so I won't have to make a batch everytime. Today this bath saved me - especially since it's so chilly out! How to use: Mix all ingredients or put them in a jar and shake it up! Add to a warm bath and hop in. **Make sure you have water to hydrate yourself, I usually end up drinking about 24 oz. You'll want to stay in the bath for 15-20 minutes - if you feel dizzy just get out, lay down on a towel and get back in one more time. You can repeat this 2-3 times if you want to. Dry off gently and slowly, if you're sick with congestion or flu, but a vapor rub on your chest. Tie your hair back and get into cotton or lightweight pajamas, preferably pants and go to bed! 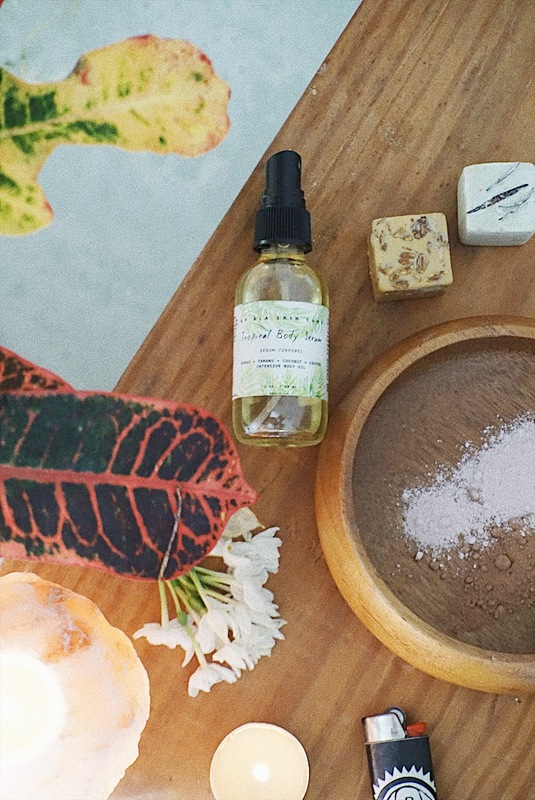 What to expect: This blend works to stimulate your blood flow and helps the body to sweat out illness essentially, so you're going to sweat throughout the night because the ginger and epsom salt are bringing heat to the skin. In the morning take a shower if you can! If you have any questions, just leave a comment below! Sometimes we run ourselves to the ground and need a little recovery. The past couple of weeks I’ve truly overworked myself. Mostly I’ve been hard on myself and being emotionally burnt out is sometimes harder to deal with than physical exhaustion. Ive always dealt with minor depression and anxiety, so I find myself burning out quicker than I should. I know that when I feel this way I should start taking supportive adaptogenic herbs and eating regularly. One of my favorite recipes to calm down at night is this raw cacao drink- a version of hot chocolate that had essential fats for the brain, magnesium to calm your nerves and kava for anxiety and overthinking. ** if you prefer to make kava water, use that in place of the 1/4 cup water! I like to enjoy this with a nice face mask and a movie. Natural balms are great for winter- I carry them everywhere! You can do literally everything: lip balm, eyebrow + fly always + edge pomade, matte lip balm remover (works wonders for a matte lip stick reapplication while out! ), dry spots, cuticles, removing makeup, add to a mask instead of oil for a balmy glow. Get ready for winter and make a whole batch, put one in every bag so you’ll never be dry and patchy! Calendula is one of my favorite flowers for beauty and wellness. It is a powerful, yet super gentle herb that can be used topically and internally (yes, it's a gorgeous edible flower!). Calendula is a type of marigold and is part of the Asteraceae family. You can use this for a wide array of skin and stomach disorders, it is so gentle that many baby rash and skin formulations are Calendula based. Calendula in traditional medicine is warm and drying. This contributes to it's immense healing properties. It is antiviral and anti-inflammatory and is used topically for treating acne and rashes, and is known for reducing bleeding and soothing irritations. Calendula is the best herb/flower for repairing the skin because it naturally helps the skin to build more collagen for repair. Trust me, this stuff is magic when it comes to cuts and dry lips! What Can I Use Calendula For? Topical: Skin irritations, rashes, cuts and infections, as a cuticle oil - use topically through a salve, balm, cream or infused oil. Topical: as a lip moisturizer, especially during a dry winter or cold sore season, as Calendula is known to fight bacterial and viruses - you can check out our Calendula Lip Oil Roll On here! Internal: Stomach ulcers, and inflammatory stomach disorders by drinking a tea, or adding Calendula to a soup, bone broth, or stew. Another fun recipe is Calendula (and any edible flower) ice cubes! 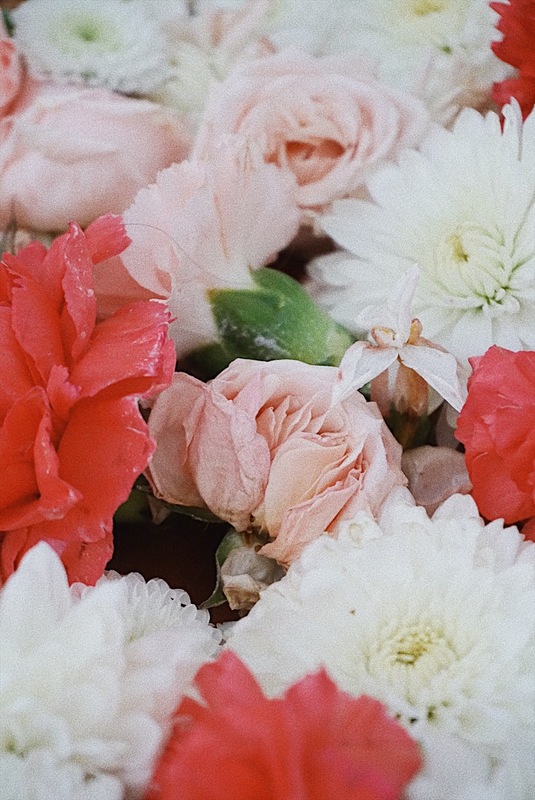 All you do is place the flower, dried or fresh, into an icetray with water or tea and let freeze! Super cute! Thanks so much for reading! Hope you enjoyed learning a little bit about one of my favorite ingredients. I created a video to help explain some of the benefits of Calendula, watch below! I know it's pretty bad quality, but hey, I'm learning! Promise the second the video will be much better! Clove is a globally used spice as well as a traditional medicine. Clove invokes memories of Christmas, chai lattes and winter. Clove is widely known for its wide range of medicinal benefits; cloves naturally have high levels of Eugenol. Eugenol is naturally antibacterial, antimicrobial, antifungal; they are used as a numbing agent and a digestive aid. It’s officially safe to say cloves are little medicinal powerhouses. I love plants with such a wide array of uses, these are the medicines I like to keep handy; especially while travelling! Put a drop in water for bloating, gas, potential parasitic infections and general stomach upset; put a few drops in oil and rub onto rashes and blemishes to disinfect and heal them with the rich antioxidants. Did you know clove oil is one of the best remedies for parasites, fungal rashes, .. and it works as a bug spray alternative and a face wash.
Aside from internal medicine, cloves are excellent for the skin. Naturally, plants like clove with high levels of antioxidants make an excellent addition to skin care. Acne, which causes skin issues such as whiteheads, blackheads, scarring, flaking skin and are the result of bacteria stuck in pores. Clove is naturally an antimicrobial and the smallest amount put in a carrier oil can disinfect skin while retaining natural moisture. Similar to the popular tea tree oil, only more effective. The only qualm is that clove is potentially irritating, which is why only a small amount is used in skin care. 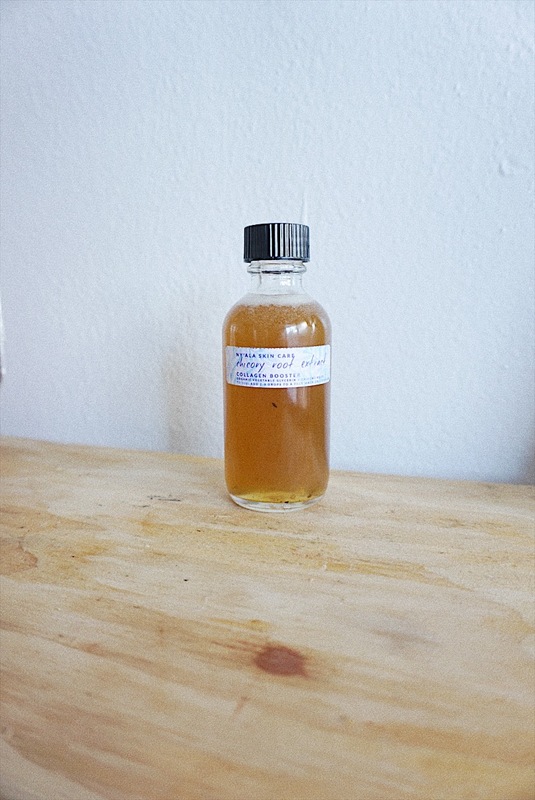 Rashes and cuts – this is partially what makes clove oil an essential travel medicine. I always get odd rashes, cuts, mild infections and bites – a bit of clove oil diluted in coconut oil or an infusion (clove tea) is the best remedy. In 2016, Ny’Ala will offer a full line of products containing Madagascar Clove, made specifically for skin repair and healing. We will have a scrub and a matching healing oil – so check back with us for updates on our progress! Do not take clove oil internally unless you are professionally trained or talk with your doctor/herbalist. Do not apply clove oil directly to skin unless properly diluted or in a professional skin care product.